The Scurrg H-6 Bomber was crafted with combat versatility in mind. It was armed with powerful shields and a bristling array of destructive weaponry, and one of its prototypes was infamously stolen by Captain Nym. 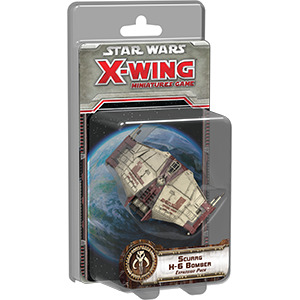 You’ll find not one, but two different ship cards for this notorious pirate in the Scurrg H-6 Bomber Expansion Pack for X-Wing, allowing you to fly him with the Rebellion or the galaxy’s Scum and Villainy. Additionally, the expansion’s pre-painted, small-base miniature starship is accompanied by three other ship cards, plus a hefty complement of ten upgrades laden with ordnance.